Have you ever wanted to hook up your Intellivision to GPS? Now you can! is plugged into a PC, but this is not relevant to connecting to the GPS hardware. This project grew out of my studying of the ECS's UART registers, which were poorly understood. As far as I know, this program demonstrates the first time in decades that anyone has read data from the AUX port into the ECS (writing out the AUX port previously known from the ECS's printer code in ROM). I eventually plan to present more formal register documentation later. For eager/curious developers, the source code here contains preliminary definitions of the registers and bit-fields. Since further research is still being done, expect some of the bit-field names to change in the future. For example, one unnamed bit field has recently been observed to change values but is still not fully understood at this time. ROM and source code provided below. Very interesting! This seems to indicate that there are differences between the printer ports on the ECS and on the Aquarius, which I had always understood to be the same. On the Aquarius port, the tip, ring, and sleeve are wired to Tx, CTS, and GND, respectively; an Rx signal is not provided. Long answer: Here's a number of items regarding the ECS and serial ports in general. CTS - Clear To Send means that the device can accept more bytes. DSR - Data Set Ready. Wikipedia says it means "device can send and receive data". Other sources say it means "device is on and functioning". Some serial printers use CTS for flow control while others use DSR for flow control. This inconsistency causes confusion since users have to read documentation on which one to use with their particular printer. Many UARTs have hardware to prevent transmission if CTS is deasserted on input (or auto-deassert CTS on output if roles are reversed). It is less common to see this in DSR (left to software to handle). Thank you for that! The ECS UART is definitely more versatile than the Aquarius printer port, then, since the Aquarius provides no means of reconfiguring it or using it for anything other than printers. A pity, but I'm glad to see that other possibilities for the ECS are being explored. Here's a photo of the DE-9 cable I made for the video. The switch controls whether the ECS's ring pin is routed to the Rx or CTS on the DE-9 female connector end. 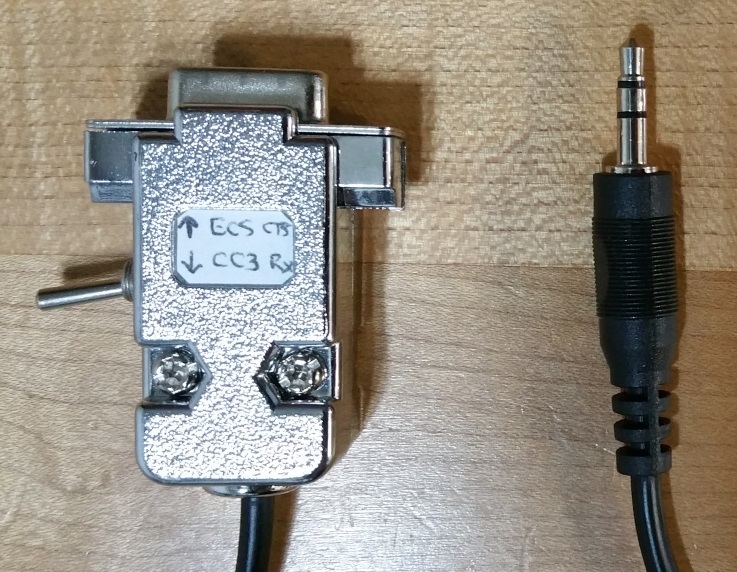 The original intention was to have 1 cable that would work for both the ECS and the Cuttle Cart 3 to connect to a PC, which is why the label says "ECS CTS" and "CC3 Rx". Inside, there are some pins on the DE-9 that loop back to other pins to fool the PC into that hardware flow control is fully implemented when it really is only half present, similar to how some null modems cables work. Side note: yes, the Cuttle Cart 3 uses a 2.5mm jack instead of the more common 3.5mm but an off-the-shelf adapter fixes that. On my own CC3, I just build the adapter into the cartridge case. 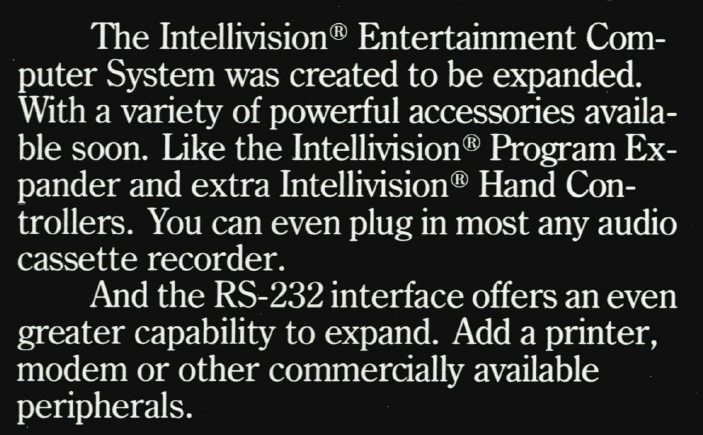 Now we need Intellivision navigation software. Intellivision style with the graphics of Auto Racing. Kudos! This is a wonderfully original and cool way of demonstrating the ECS serial functionality. - "Hello Commander, computer reporting." - "Get me directions to the department store, I need to buy some healthy grains ..."
- "Target's on sight! Watch out ... for flaks." Lathe, you should send a prototype to Elon Musk so he can install it in the next Tesla he rockets into space. This should go great with the Inty in my RV! Now we need a moving map to go with it for 1980s style "here's where you are" Concorde screen! Well, now that you have mastered the port, surely a rumbling seat mod for your car will be next? Well, not quite mastered it yet but soon. If I were to offer control for something that rumbled, how about the Hitachi Magic Wand?